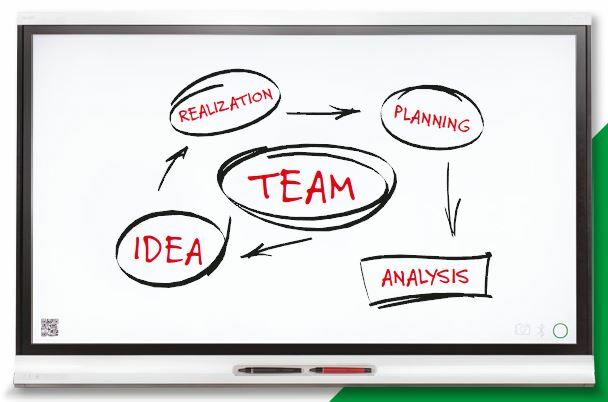 The flat-panel display is one of the most common technologies found in meeting rooms and classrooms today. A more modern alternative to the projector, the flat panel display provides video, audio and moving data to a once still room. However in the growing mobile, multi-device era, this trusty technologies now needs to cater for today’s digital, device dependent users. Remote participation: Invite participants to join and contribute to the collaboration session via an app. Anyone from any web browser of SMART kapp iQ board can contribute into the meeting. Two-way whiteboarding: Host sessions between multiple Kapp IQ boards. Rich user experience: Bring documents, applications, data and presentations into the discussion for marking up. With multiway sharing, all users can write on the display in real-time from any device. With a range of different inking colours, ideas can come alive and help identify individual contributions. Plus, you can connect any Android or iOS device to the SMART Kapp IQ to share and save in real time to any connected laptop, tablet, smartphone or other SMART Kapp IQ display. Why the SMART Kapp iQ? More than just a whiteboard or HD display, the SMART Kapp IQ revolutionises the workspace and classroom, taking the features from the traditional SMART interactive whiteboards that we know and love, and bringing them forward to solve today’s business challenges. The SMART Kapp IQ offers two different models to accommodate any size space, wherever you are located. Whether for business collaboration, remote brainstorming, classroom engagement or training sessions, the SMART Kapp IQ is the perfect fit for any setting. The SMART Kapp IQ app is where the magic happens. Simply connect to the display through the SMART Kapp app using a QR code, and share the meeting with participants in the room or across the globe for multiway sharing, capturing and saving. The SMART kapp mobile application makes it simple for everyone to capture, save, and share notes and content that has been written on either the SMART kapp or SMART kapp IQ. The app lets you save your notes and drawings without the hassle of having to rewrite them or take photos of your dry-erase boards. 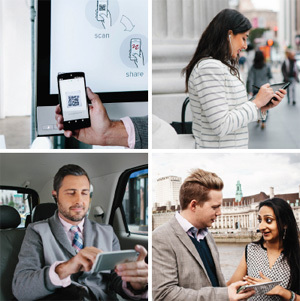 To connect a compatible Android phone or tablet to SMART kapp or SMART kapp iQ, simply scan the QR code to initiate a Bluetooth® connection or tap the NFC tag. Once connected, the content from the board can be saved to the device. Use the app to save and share snapshots, and retrieve and share previously captured snapshots. Content on a SMART kapp product can be streamed live for remote viewers to view in real-time using any browser on any device. 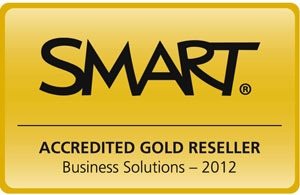 We are a SMART Gold Business Provider, one of only 15 in the UK who is trained, accredited and recognised by SMART as a preferential supplier into the corporate and healthcare sectors. Our teams are trained in product knowledge & integration, with expert installers and technicians available for ongoing support and maintenance of SMART solutions. VideoCentric have SMART technology installed into our lab and demonstration suite, and can demonstrate SMART solutions in specialist demonstration centres across the UK. Our experience of SMART solutions spans over 15 years, and includes simple interactive whiteboard installations and SMART podium integrations for meeting rooms and lecture theatres and SMART Bridgit remote collaboration services in the cloud to full interactive deployments on oil rigs in the Middle East, integrated with video communications infrastructure, bespoke controllers and collaboration endpoints. VideoCentric are the only UK partner to focus on the provision of SMART solutions into the healthcare sector. For more information on how SMART solutions can assist with patient care, see SMART for Healthcare: Improving Patient Care with Interactive Technology. Talk to us today to find out more about the SMART Kapp IQ and other interactive solutions for your collaboration spaces, or to arrange a demonstration at your local interactive demo centre.